Tourists love to wander around the Stephen Avenue Walk in the downtown area of Calgary, Alberta where skyscrapers tower above you. The Stephen Avenue Walk in the downtown core of Calgary, Alberta is where people flock to and explore the various activities and excitement that takes place here. Everything you can possibly imagine is found along the street below the tall skyscrapers such as shopping centers, theaters, pubs, restaurants, festivals and an assortment of entertainment put on by buskers. 8th Avenue, Stephen Avenue Walk, downtown Calgary, Alberta, Canada, North America. 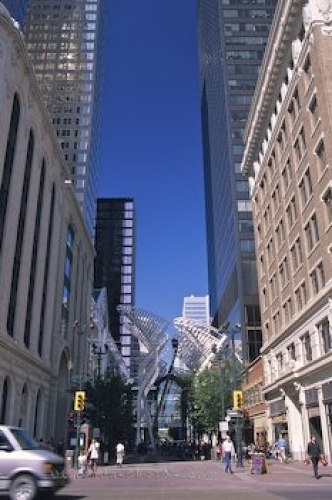 Picture of the Stephen Avenue Walk in downtown Calgary, Alberta where skyscrapers tower above you.